While the term “flute” refers to a broad number of instruments which are found in many different cultures, we will be exploring the history of our modern flute. There are many names for this special kind of flute. 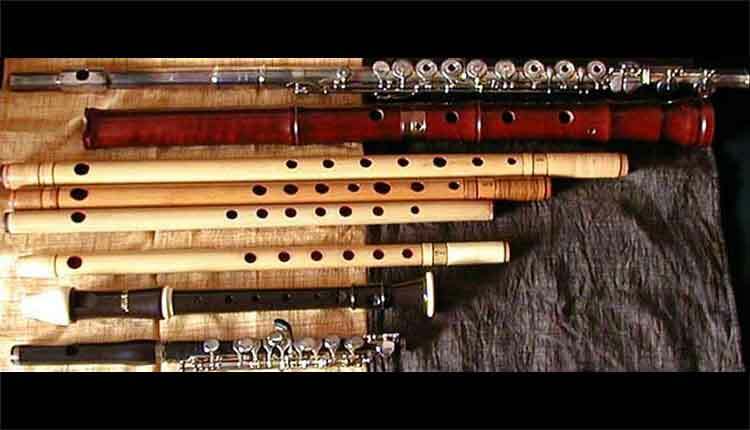 These names include: cross flute, German flute, transverse flute and flautotraverso. What is important about all of these names is that they define an instrument that is held horizontally while being played. A flute dating back to approximately 900 B.C. was found in China and called a ch’ie. To date, the oldest flutes have been found in the Swabian Alps region of Germany, and are said to have been from about 43,000 to 35,000 years ago. Pre-Christian drawings of the early flute appear on Greco/Roman artifacts. Additional works of art, including two Etruscan reliefs which date from the second and third centuries B.C., clearly show cross flutes being played. While history is scarce from this era, there is enough information to suggest that our instrument was played by the Romans and Etruscans, but not by the ancient Greeks. It is interesting to note that the flute seems to disappear with the fall of Rome and only begins to reappear in the 10th and 11th centuries. It is probable that the instrument was introduced into Western Europe by way of Germany from Byzantium. By the 14th century, the flute began to appear in non-Germanic European countries, which included Spain, France and Flanders. By the beginning of the 15th century, flutes are shown in various sorts of pictures in all parts of Western Europe. Throughout the 16th century flutes were one of the most popular instruments of the Italian musical scene. This popularity was also echoed in England as was obvious from Henry VIII’s large collection of flutes. These instruments were extremely simple in construction, consisting of a cylindrical tube with a cork stopper in one end, a blow hole and six finger holes. Their range was limited, as they were constructed in different sizes in order to handle the complete range of the music being performed. It is the middle-sized instrument of this group pitched in “D” that is the direct ancestor of our modern concert flute. This instrument went out of favor during the first half of the 17th century because it could not compete in playing the new expressive style which the violin had made popular. Woodwind makers responded to this challenge by making many improvements to the flute during the second half of the 17th century. Among the important French players/makers of this period was the Jean Hotteterre family who were employed by the royal court. The body of the flute went from one piece to three: the head joint, the body and foot joint. While the head joint of the flute stayed cylindrical, the bore of the body became conical with the lower end of the flute being the smallest diameter. The foot joint was also conical with the bore becoming larger at the bottom end. This type of design for the bore of the instrument has remained unchanged today in our modern piccolos. The tone holes of this new instrument remained at six, but they were much smaller and a key was added to produce an E-flat. This instrument could, through the use of cross-fingerings, play all of the chromatic notes. By 1720, the body was divided into two parts and extra joints of differing lengths, called corps de recharge, allowed the performer to shift the pitch of the instrument in order to be in tune with different orchestras. However, because of the cross-fingerings, these flutes sounded best in keys of D- and G-Major. While there were many amateur performers of the time who played the flute poorly (out of tune), the professional performers of the time mastered these challenges extremely well. The treatises by Quantz (1752) and Tromlitz (1786) included a variety of fingerings for each note on the instrument which reflected very subtle changes of pitch. In spite of exceptional performers, flutemakers were very concerned about adding keys to eliminate the cross-fingerings of chromatic notes. By 1760, G-sharp, B-flat and F keys were added by flutemakers in London. By 1780, these instruments were appearing in instrumental music of Mozart and Hayden. In addition, flute makers extended the range of the instrument downward by adding low C and C-sharp keys to the foot joint (just like today’s modern flute). By the end of the 18th century, two more keys were introduced which resulted in the 8-keyed flute. This instrument formed the basis of most “simple system” flutes which are still being played today in various Celtic ensembles. Theobald Boehm (1794-1881) is considered to have created the most important evolution of the flute in its entire history. Boehm was born in Munich and was trained as a jeweler and goldsmith. His aptitude for music was very apparent as a young child, and by 1818 he was dividing his careers among that of goldsmith, flutemaker and professional flutist in the orchestra of the royal court in Munich. By 1828, Boehm had put together a workshop to manufacture instruments. In 1831, while visiting London, Boehm attended a concert of Charles Nicholson whose flute had unusually large finger holes which produced an exceptionally large and fine tone. Realizing that this tone would have to be imitated for a concert flutist to be successful, and understanding that the tone holes would have to be spaced for good intonation rather than for the convenience of the fingers of the player, Boehm designed a new mechanism that functioned as an extension of the fingers. This conical flute of 1832 was gradually accepted by the most important players of the time, and by 1843 Boehm had licensed flutemakers in London and Paris to manufacture this new instrument. In 1846, Boehm continued to perfect the flute while studying acoustics with Carl von Schafhautl at the University of Munich. In 1847, Boehm produced a radically different instrument with a cylindrical body, a foot joint and a parabolic head joint. The tone holes on this instrument were even larger than the 1832 instrument and Boehm had to design padded cups for each hole. This new instrument has received only a few relatively unimportant modifications throughout the 20th century and it is a tribute to his genius that Boehm’s flute will remain unchanged into the 21st century. Arthur Gemeinhardt (Kurt’s father) trained under Emil Rittershausen in Berlin. Mr. Rittershausen was a Boehm flute specialist who trained under Boehm and his partner Carl Mendler Sr. in Munich. So, the tradition and origin of the Gemeinhardt flute can be traced directly to the 19th century and Theobald Boehm’s factory.